For the Indian cricketer, see Pritam Chakraborty (cricketer). 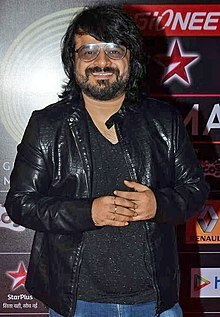 Pritam Chakraborty (Bengali: প্রীতম চক্রবর্তী; born 14 June 1971), mononymously known as Pritam, is an Indian composer, record producer and music director for Bollywood films. Pritam was born in a middle class Bengali family to Anuradha Chakraborty and Prabodh Chakraborty. His father, who was an insurance officer, used to teach light music on western instruments to young kids for a nominal fee, till an accident forced him to quit his job and concentrate on the meager earnings from his music school. Pritam gained his early training in music from his father and learned to play the guitar while he was still in school. After completing his schooling at St. James' School and Graduating in Geology in 1992 from Presidency College, Pritam dropped out of his M.Sc. classes in 1993 to chart a career of his choice from FTII, Pune where he took up Sound Recording and Engineering in 1994. During this time, he was offered a chance to compose background music for a film by the Hungarian filmmaker Istvan Gaal. He also learned African music from musicologist Kedar Avati. Pritam joined a Bangla band, Chandrabindoo. Before that he formed another band with his Presidency batchmates, called "Jotugriher Pakhi" for which, he used to play the guitar. They even have a cassette released to their credit at that time. After completing his sound engineering course from FTII Pune, Pritam came to Mumbai in 1997. He started composing ad jingles and became friendly with other young strugglers such as Shantanu Moitra, Rajkumar Hirani, Sanjay Gadhvi and Jeet Gannguli. Pritam composed renowned jingles for brands like Santro, Emami, McDonald's, Head & Shoulders, Thums Up, Limca, Complan and composed title tracks for TV serials such as Astitva, Kkavyanjali, Ye Meri Life Hai, Remix, Kashmeer, Miilee, and Dil Kya Kare. I was living in a humble suburb, and in the same building lived Jeet Gannguli, who was also struggling. We used to jam in our spare time and decided to come together for films, though I always did my ad films and serials solo. Abbas Tyrewala was the writer and lyricist (of tere liye), and we were all newcomers. But the film did not work at the box-office. However, Gadhvi was soon signed by Yash Raj Films for Mere Yaar Ki Shaadi Hai, and my song 'Sharara' became very popular. At that point of time, we could only get a small movie, Mudda - The Issue starring Arya Babbar. Jeet had taken ill, so when Hirani came and offered us Munna Bhai MBBS, we could not accept it. Soon after, over some misunderstanding, Jeet decided to split and the partners went their separate ways. Pritam had built a name for his compositions by finely blending Indian classical music with western influences. His compositions for Gadhvi’s second movie Dhoom were a runaway hit. The title-track of Dhoom in two versions – Hindi (by Sunidhi Chauhan) and English (by Tata Young) – broke geographic barriers becoming popular in pubs in the UK, USA and the East Asia and won him a Zee Cine Award for Best Track of the Year. He received two nominations for Dhoom. He followed this up with compositions for films like Gangster and Dhoom 2. His compositions for Anurag Basu's Life in a... Metro garnered him very positive reviews. He formed a band called Metro with Suhail Kaul, Soham Chakraborty, Eric Pillai and Bangladeshi singer James for the movie. He won his second Zee Cine Award for Best Track of the Year for the song "Mauja hi Mauja" from Jab We Met by Imtiaz Ali. Jab We Met won him his first Apsara Award for Best Music Director. He composed for two more Imtiaz Ali films, Love Aaj Kal and Cocktail which were critically and commercially successful and gave him many awards and Nnominations. His Sufi songs for the 2010 movie Once Upon A Time in Mumbaai were immensely popular with the masses and songs like "Pee loon" and "Tum Jo Aaye" were declared chartbusters. He teamed up again with Mahesh Bhatt and Vishesh Films for music of Crook of which the song "Mere Bina" got instant recognition with public. His foot-tapping numbers for Rohit Shetty's Golmaal 3 were also equally successful. In 2011, he got to work for Salman Khan's Ready and Bodyguard. He recreated the famous 1971 song, "Dum Maro Dum" for Ramesh Sippy's 2011 movie of the same name. He then composed for the romance Mausam which had a strong influence of Punjabi. The songs were phenomenal hits in Northern India with "Rabba Main To Mar Gaya Oye" being a rage among people. In 2012, he composed several successful songs for films like Players, Agent Vinod, Jannat 2 and Vidhu Vinod Chopra’s Ferrari Ki Sawaari, where he finally get to work with him and Rajkumar Hirani. Later that year, he scored music for Barfi! which won him two Filmfare Awards. Barfi is considered to be one of the most critically acclaimed soundtrack album of his career. By 2013, his list included Race 2, Murder 3, Yeh Jawani Hai Deewani, Dhoom 3 and Once Upon ay Time in Mumbai Dobaara which was his 100th movie as a Music Director in Bollywood. He started 2014 with compositions for Yaariyan, Shaadi Ke Side Effects & Holiday: A Soldier Is Never Off Duty. He then took a break in 2014. He marked his return with three successful albums in 2015: Kabir Khan's Bajrangi Bhaijaan & Phantom and Rohit Shetty's Dilwale for which he was nominated for Filmfare awards. The Song, "Gerua" from Dilwale directly opened at the No. 1 position on the Radio Mirchi charts and became the first Bollywood song to cross 100 million views on YouTube in the shortest duration ever. It also ranked in the top slot in places like Malaysia, Oman, Sri Lanka and Bahrain. In 2016, he appeared as a guest composer & composed the song "Itni Si Baat Hai" for Azhar while the other composer of that album was Amaal Mallik & DJ Chetas. He also composed the whole soundtrack of Dishoom, Ae Dil Hai Mushkil & Dangal. In 2017, he composed the soundtrack of Jagga Jasoos, Raabta along with Sohrabuddin, Sourav Roy & JAM8, Tubelight and Jab Harry Met Sejal along with Diplo. In 2018, he will compose the soundtrack of Race 3 along with Meet Bros, Vishal Mishra and JAM8. In 2019, he will compose songs for Brahmastra & Kalank. Pritam has composed in a variety of genres including Rock (Life in a... Metro), Sufi (Once Upon A Time In Mumbaai) and even Ghazals (Barfi). His musical style is mainly characterized as a delicate fusion of Indian classical music with western influences. In an interview given to Stacey Yount for Bollyspice, Pritam said "I really do prefer doing rom-coms over action films." Lyricist and singer Amitabh Bhattacharya said about Pritam, "It is very challenging to work with Pritam. Right from the day he cracks the song, till the day the song goes out, he is constantly working, re-working, doing changes in the song, He keeps me on my toes and that is very exciting to me. We debate a lot regarding our songs and ultimately the result is always good, His spectrum as an artist is vast. It is always good to work with composers who have range." Singer Kavita Seth said "Pritam’s melody is very strong. You hear it once and it will stay with you, it is addictive." Several sources have stated that Chakraborty plagiarised songs in the early phase of his career and has a history of lifting tunes from other compositions. Even his recent composition from the movie Ae Dil Hai Mushkil has allegations of plagiarism. 2012 - Album of the Year - Barfi! 2012 - Music Composer of the Year - "Ala Barfi" from Barfi! 2012 - Music Composer of the Year - "Phir Le Aya Dil" from Barfi! 2012 - Background Score of the Year - Barfi! Pritam won 17 awards for composing Ae Dil Hai Mushkil's soundtrack, highest no. of awards he received for composing a film's soundtrack to date. Second to it is Barfi! 's soundtrack. Won Critics' Choice Song of the Year Award at Mirchi Music Awards for "Channa Mereya"
Won Zee Cine Award for Song of the Year for "Channa Mereya"
Won BIG Zee Most Entertaining Song Award for "Ae Dil Hai Mushkil"
Won Platinum Disc at MT20Jubilee Awards for "Channa Mereya"
Won Platinum Disc at MT20Jubilee Awards for "Ae Dil Hai Mushkil"
Azhar Composed 1 song, "Itni Si Baat Hai"
Won Critics' Choice Song of the Year Award at Mirchi Music Awards for "Hawayein"
Nominated for Zee Cine Award for Song of the Year for "Galti se Mistake"
^ "Pritam Chakraborty Turns 45 Today! Here's A Few Songs! - SirG.co". 14 June 2016. Retrieved 6 October 2016. ^ "Pritam Chakraborty Biography". cinemagigs. Retrieved 19 November 2015. ^ "Pritam Playing Guitar". Prosenjit Das. Retrieved 19 September 2011. ^ "Song Listing for Pritam". MySwar. Retrieved 20 January 2016. ^ "The new melody moguls". The Telegraph. 10 December 2005. Retrieved 7 March 2016. ^ "Pritam Chakraborty: Filmibeat". Filmibeat. Retrieved 13 February 2016. ^ "The other Bong connection". The Telegraph. 20 March 2006. Retrieved 7 March 2016. ^ "'The Music of Dhoom Had To Be Zip-Zap-Zoom!'". Rediff.com. 31 August 2004. Retrieved 7 March 2016. ^ "Soham Chakraborty on In Dino". Rediff.com. 9 July 2007. Retrieved 7 March 2016. ^ "Pritam Chakraborty". Cinemagig. Retrieved 13 February 2016. ^ "Neighbours, now melody-makers - Jeet-Pritam: Two boys from Bengal strike a crescendo in Bollywood". The Telegraph. 27 September 2002. Retrieved 7 March 2016. ^ Sinha, Lata (31 December 2004). "The Telegraph". www.telegraphindia.com. Retrieved 6 October 2016. ^ Sharma, Devesh. "Dhoom machale!". Retrieved 6 October 2016. ^ "Interesting facts about music of Gangster". Indiaglitz. 20 March 2006. Retrieved 6 October 2016. ^ "Life in a... Metro - Times of India". The Times of India. TNN. 12 March 2007. Retrieved 6 October 2016. ^ Gopal, Sangita (2012). Conjugations: Marriage and Form in New Bollywood Cinema. Chicago, IL: University of Chicago Press. p. 153. ISBN 9780226304274. ^ "Music of 'Life in a Metro' launched". www.livemint.com. 29 March 2007. Retrieved 6 October 2016. ^ Sen, Raja (20 December 2010). "The best Bollywood soundtracks of 2010". Retrieved 6 October 2016. ^ "Top 10 Bollywood songs of 2010 - The Express Tribune". IANS. 23 December 2010. Retrieved 6 October 2016. ^ Pahwa, Kiran (2 July 2010). "'Pee loon' stands out in 'Once Upon A Time...' soundtrack". Retrieved 6 October 2016. ^ "'Bulleya' sufi track from Ae Dil Hai Mushkil". Indian Times. Retrieved 12 September 2016. ^ Tuteja, Joginder. "Emraan-Pritam 'jodi' strikes again with CROOK - bollywood news : glamsham.com". www.glamsham.com. Retrieved 6 October 2016. ^ "Pritam packs in retro feel in 'Golmaal 3' soundtrack | TopNews". www.topnews.in. Retrieved 6 October 2016. ^ "Rohan Sippy bags remake rights of '70s hit song 'Dum Maro Dum'". archive.indianexpress.com. The Indian Express. 1 December 2010. Retrieved 6 October 2016. ^ Sinha, Meenakshi (2 May 2011). "Action replay: Bollywood grooves to retro classics". The Times of India. TNN. Retrieved 6 October 2016. ^ Abid. "Mausam music review". www.glamsham.com. ^ Yount, Stacey (11 January 2012). "Top 50 Songs of 2011". Retrieved 6 October 2016. ^ Vijayakar, R.M. (30 August 2011). "Composer Pritam's Musical Experiments Are Paying Off". Indiawest.com. Retrieved 7 March 2016. ^ a b c d e "Live Blog: 58th Idea Filmfare Awards 2013". The Times of India. 21 February 2013. Retrieved 16 February 2016. ^ "Pritam Joins Dhoom 3". www.koimoi.com. Retrieved 6 October 2016. ^ "I am disorganised. I made 10 other girls sing Daru Desi before Shalmali: Pritam". SantaBanta.com. Retrieved 7 March 2016. ^ "Pritam composed nothing in 2014; to make a smashing comeback in 2015". The Times of India. 14 June 2015. Retrieved 7 March 2016. ^ "Composer Pritam to resume work from November". IBN live. 9 October 2014. Retrieved 7 March 2016. ^ a b c "Nominations for the 61st Britannia Filmfare Awards". The Times of India. 12 January 2016. Retrieved 16 February 2016. ^ a b Lakshmi, V. (8 January 2016). "Music composer Pritam talks about his work and travels in the past year and the months to come". The Times of India. TNN. Retrieved 6 October 2016. ^ "Gerua is the first Bollywood song to cross 100 Million in the shortest duration: Pritam". Retrieved 6 October 2016. ^ Pandey, Prachita (10 July 2017). "JHMS song 'Safar': Imtiaz Ali, Pritam and Irshad Kamil share the screen with Shah Rukh Khan in this heartwarming number". Daily News & Analysis. Retrieved 7 August 2017. ^ "Adesh Srivastava, Pritam Chakraborty, Shankar Mahadevan and Himesh Reshammiya to mentor Sa Re Ga Ma Pa this year". IndiaTimes.com. 1 July 2008. Retrieved 13 February 2016. ^ "Zee Bangla's 'Sa Re Ga Ma Pa' all set to go global". 30 June 2008. Retrieved 13 February 2016. ^ "Hrithik's Music Video for Just Dance". The Tribune. 31 October 2011. Retrieved 13 February 2016. ^ "'MTV Unplugged' Season 5 Features Pritam Chakraborty, Jubin Nautiyal". 14 December 2015. Retrieved 13 February 2016. ^ "Mika Singh, Pritam Chakraborty and Sajid-Wajid reintroduce the musical show with a refreshing format!". 27 March 2016. Retrieved 29 March 2016. ^ "Pritam Chakraborty Biography - Saavn". Saavn. Retrieved 13 February 2016. ^ "PRITAM TALKS MUSIC AND CREATING THE SONGS OF DILWALE – EXCLUSIVE". Bollyspice.com. 28 December 2015. Retrieved 13 February 2016. ^ "Pritam keeps me on my toes". Indian Express. Retrieved 13 February 2016. ^ "Bollywood has made sufi music a separate genre". The Times of India. 12 February 2016. Retrieved 16 February 2016. ^ "List of songs Copied by Pritam Chakraborty". www.fulldhamaal.com. Retrieved 10 October 2016. ^ "Pritam Loved These 14 Tracks So Much That He Just Lifted Them As It Is?". www.koimoi.com. Retrieved 9 June 2017. ^ a b c d e f g "Pritam wins another International award for Barfi". Bollywood Hungama. 22 March 2013. Retrieved 16 February 2016. ^ a b c "Filmfare Awards 2012 / 2013 Nominations". Retrieved 7 March 2016. ^ "Winners of the Filmfare Awards 2017". 14 January 2017. Retrieved 8 April 2017. ^ "2005 Filmfare Awards". Awards and Winners. Retrieved 7 March 2016. ^ "Nominations for the 52nd Filmfare Awards". Filmibeat. 9 February 2007. Retrieved 7 March 2016. ^ a b "53rd Filmfare Award Nominations". Indicine. Retrieved 7 March 2016. ^ "54th Filmfare Awards 2008 Nominations". Bollywood Trade News Network. 17 February 2009. Retrieved 7 March 2016. ^ a b "Filmfare Awards 2010 Nominations". Awards and Shows.com. Retrieved 7 March 2016. ^ "Filmfare Awards 2011 Nominees". Desiblitz. Retrieved 7 March 2016. ^ "Filmfare Awards 2014: The list of nominees". IBN live. 14 January 2014. Retrieved 7 March 2016. ^ "MMA Mirchi Music Awards". MMAMirchiMusicAwards. Retrieved 31 May 2018. ^ "Mirchi Music Award Hindi 2012". www.radiomirchi.com. Retrieved 31 May 2018. ^ a b c "ITA Award for Best Title Music/Song Track (Indian Television Academy Awards) - Winners". awardsandwinners.com. Retrieved 27 May 2016. ^ "8th Annual Central European Bollywood Awards". Bollywood Forum. Retrieved 7 March 2016. ^ "Pritam, Sonu, Rahman win MTV Video Music Awards". RadioandMusic.com. 22 March 2013. Retrieved 7 March 2016. ^ Staff, India West. "Shabana Azmi, Sooraj Barjatya, Bappi Lahiri Receive Dadasaheb Phalke Award". India West. ^ a b "GiMA Awards 2016: 'Bajirao Mastani' bags maximum awards; Yo Yo Honey Singh, Sonakshi Sinha, Arijit Singh perform live [PHOTOS + WINNERS' LIST]". International Business Times, India Edition. Retrieved 27 May 2016. ^ "Filmfare Awards 2005". Awardsandshows.com. Retrieved 19 January 2016. ^ "Pritam Chakraborty Awards". Bollywood Hungama. Retrieved 20 May 2011. ^ "RMIM Puraskaar 2009". Awards.giitaayan.com. Retrieved 19 November 2013. ^ a b "Nominations for 6th Apsara Film & Television Producers Guild Awards". Bollywood Hungama. Retrieved 20 May 2011. ^ "I don't care about jury: Pritam". Sify Movies. IANS. Retrieved 20 May 2011. ^ "Winners of 17th Annual Star Screen Awards 2011". Bollywood Hungama. Retrieved 20 May 2011. ^ "RMIM Puraskaar 2012". Awards.giitaayan.com. Retrieved 19 November 2013. ^ "No big stars in my movie: Divya Kumar". Hindustan Times. 18 June 2012. Retrieved 10 January 2013. ^ "Pritam: Scoring romantic tracks for Shah Rukh Khan and Kajol is a blessing". The Times of India. Retrieved 10 November 2015. ^ Mathur, Kajol (23 April 2018). "Here's an interesting update from Varun Dhawan on Kalank". Filmfare. Retrieved 17 June 2018. ^ Vijayakumar, R. M. (18 April 2018). "Karan Johar's Epic Drama 'Kalank' Release Date Announced, Brings Back Madhuri Dixit-Sanjay Dutt Duo". India West. Retrieved 17 June 2018.